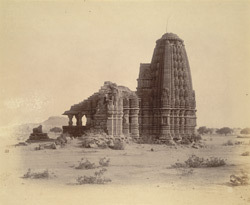 Photograph of the Manikeshvara temple, Jhodga taken by Henry Cousens in the 1880s or 1890s by Henry Cousens. Today, Jhodga, located in northern Maharashtra, is a large town. Cousens visited the town as part of the Archaeological Survey of Western India. In the Bombay list, p. 52, it was noted that: ''...the well finished temple of Manikesvara situated at the foot of a small hill to the west of the town. It consists of a central hall with its porch and three shrines, and the main shikhara (or tower) is practically complete. The whole is richly wrought and decorated, and the temple looks exceedingly well as it stands out in the open without any surroundings. The main shrine, hall, and porch are of original construction, the two side shrines are of later and inferior workmanship, and no attempt has been made on these to preserve the lines of mouldings running round the older work...'' There is a large Nandi positioned in front of the shrine, on the left in this photograph, and this combined with the linga inside the building would suggest that the temple was Shivaite.